Eight Canadians changed the path of chemistry, winning Nobel Prizes for their innovative research. These are their discoveries, from exploring ultimate chill to probing the basic mechanics of reactions. 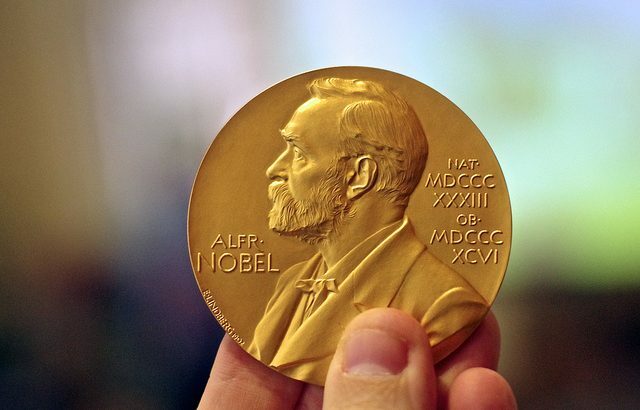 Since the first Nobel Prize in Chemistry was awarded in 1901, 171 people have shared 107 prizes. Only eight of those prizes were won by Canadians. In a classic pattern for this diverse country, nearly every Canadian winner had strong ties to other countries by birth or emigration. These are the stories of how their research was foundational to our understanding of chemistry. Born in New Zealand and spending most of his professional career in England, Ernest Rutherford had a brief stint at McGill University in Quebec. Rutherford performed some of the earliest experiments on radioactive materials, working with Frederick Soddy to develop a theory of atomic disintegration. This theory explained how one atom can spontaneously change into another atom through emitting radiation. While at McGill, Rutherford observed that radioactive atoms have an extremely regular decay rate. His realization that they decayed into half their original sample size (a “half life”) in a predictable period of time is the foundation for radioactive dating of geological materials. Rutherford also characterized the radiation of radioactive materials, classifying it into alpha rays, beta rays, and gamma rays. He continued his research at his later academic positions in England, and won a Nobel Prize for it in 1908. William Francis Giauque had the briefest association with Canada. He was born in Niagara Falls, Ontario to American parents, then immediately returned to the United States where he lived most of his life. Giauque’s research focused on the third law of thermodynamics, pushing to reach absolute zero. He developed a new magnetic refrigeration technique to chill atoms to within a single degree of this lower limit for temperature (1K, −272.15°C). Pushing the lower limit of temperature was key to unlocking new theoretical and practical research fields. It opened up research into the entropy of gases (including the discovery of the oxygen 17 and 18 isotopes), laid the groundwork for quantum statistics, and led to practical improvements in stronger steels and more efficient gasolines. Giauque won the 1949 Nobel Prize in Chemistry. Gerhard Herzberg’s emigration to Canada resulted from persecution in Germany prior to World War II. In 1933, chemist Gerhard Herzberg lost his university position when Germany instituted a new law banning anyone married to Jewish women from teaching. In the two years before fleeing the country, Herzberg and Luise Oettinger (his wife and research collaborator) acquired extremely high-end spectroscopic equipment. Spectroscopy is the study of how light interacts with matter. Early studies used prisms to split visible light by wavelength and later ones employed ever more sophisticated optical equipment. Herzberg’s equipment was in the second category, a tool far more sophisticated than anything available for research in North America. After they fled Germany, Herzberg and Oettinger arrived in Canada with just the equivalent of $5, but more importantly, the ability to do completely novel research. In the next few years, they moved from Saskatoon to Chicago before eventually settling in Ottawa, all while Herzberg made groundbreaking discoveries in molecular spectroscopy. His investigation into how atoms and molecules absorb and emit light, and in particular his interpretation of the spectra of CH2 that confirmed theories about its internal structure, won him the Nobel Prize in 1971. Herzberg started an academic legacy: two of his students are on this list for winning their own Nobel Prizes. Chemistry Nobel winners Henry Taube and John Charles Polanyi were both mentored by Nobel winner Gerhard Herzberg. Henry Taube was born in Neudorf, Saskatchewan to German-speaking immigrants. He studied under Gerhard Herzberg before moving to the United States for his graduate research. Taube brought ideas from organic chemistry into inorganic chemistry, investigating how electron transfer impacts the rates of chemical reactions in metals. This explains colourfully dramatic reactions like how baking bright green malachite mixed with black charcoal produces rich red copper, but it also plays a more subtle yet fundamental role in explaining how breathing oxygen fuels chemical reactions. Taube won the 1983 Nobel Prize for his discovery. NSERC has an award named after John C. Polanyi. John Charles Polanyi’s family sent him to Toronto to protect him when his home in Manchester, England became a bombing target during World War II. After the war, he returned to England to complete his education, then came back to Canada for his first research job at the National Research Council. He was mentored by Gerhard Herzberg, triggering his interest in looking at the energy states of atoms. As a physical chemist, Polanyi’s research focused on reaction dynamics: the mechanics of chemical reactions and how they transition from one state into another. His later research at the University of Toronto dove into the details of how hydrogen and chlorine interact to create hydrogen chloride. He and his graduate student Ken Cashion “borrowed” spectrometers from other researchers, dismantling and modifying them without permission. They were able to measure the light emitted during the state transitions to track the exact motion of molecules and the newborn products of the reaction while it was happening. This research led to Polanyi sharing the 1986 Nobel Prize with Dudley Herschbach and Yuan Lee. Born and raised in Montreal, Sid Altman followed a classically Canadian path of traveling abroad for his professional career. He joined Francis Crick’s research laboratory in England, mentored by one of the co-discoverers of DNA. His specialization was RNA, the transcribers that interpret the biological instructions coded in DNA. Altman discovered the RNase P enzyme, a special molecule that chopped the tail off RNA. Unlike normal protein-only enzymes, this one was a blend of RNA and protein, with the usual RNA strand providing the catalyst to kick-start chemical reaction. The ramifications of this discovery are ongoing. Researchers (including Altman) are optimistic that one day they’ll be able to use the enzyme to attack the common cold by chopping up the RNA of the virus before it makes people sick. Altman and Thomas Cech won the 1989 Nobel Prize for discovering and characterizing this enzyme. Born in Quebec, Rudolph Arthur Marcus started his research life at McGill University. There, he developed theories on how atoms could swap electrons, and how this electron transfer was responsible for chemical reactions. He immigrated to the United States, acquiring American citizenship and continuing his research. He won the Nobel Prize in 1992 for this work. Born in England, Michael Smith desperately wanted to relocate to western North America. He jumped at a research position in Vancouver, transitioning into biochemistry in order to make the geography work. Smith was on sabbatical at the Cambridge lab where DNA was first discovered when a casual lunchtime conversation motivated him to pursue what would become his Nobel Prize-winning research. He modified a technique for separating and purifying short DNA fragments in order to deliberately mutate genes. This capacity to create specific mutations opened up an entirely new branch of genetics, exploring how specific genes impacted organisms. He and Kary Mullis shared the 1993 Nobel Prize in Chemistry for this site-directed mutagenics. Smith donated his Nobel Prize money to research into the genetics of schizophrenia, Science World BC and the Society for Canadian Women in Science and Technology. Additional reporting by Josh Silberg. Read more about these Nobel Laureates on Science.ca, a resource created by the GSC Resource Society. Love Chemistry? We’re recruiting a new Chemistry Editor for Science Borealis! Send a cover letter and resume to contact@scienceborealis.ca to apply. Featured header image by Adam Baker (CC BY-NC 2.0). Chemistry absolute zero, Canadian science, chemical reactions, chemistry, DNA, Mika McKinnon, Nobel prize, radioactive decay, RNA, spectroscopy. permalink.